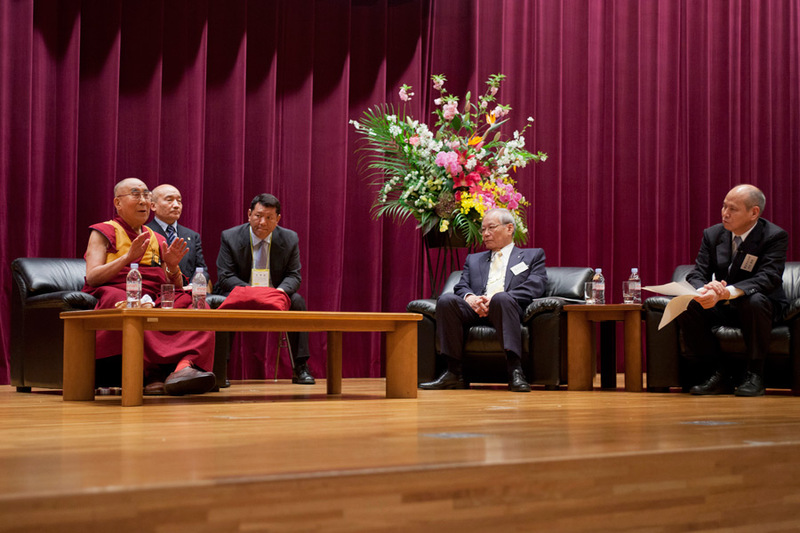 (TibetanReview.net, Apr06, 2015) – Tibet’s exiled spiritual leader, the Dalai Lama, on Apr 4 spoke to an audience of Japanese doctors in Tokyo. While 500 listened to him in the Japan Doctors Association Hall, another 166,000 members of the Japan Doctors Association across the country took part online. The Dalai Lama said that while almost every human activity can contribute to people’s welfare, doctors and nurses are often able to give people new lease of life. He referred to the existence of different systems of medicine in the world – including the Unani system from Persia and Afghanistan, Ayurveda from India and of the Chinese and Tibetan systems – and wondered whether a conference of physicians experienced in these different systems today might contribute to human progress. He said such a conference was held in Tibet’s capital Lhasa in the 8th century under the auspices of the Tibetan Emperor at that time. The audience asked him questions on a range of issues, including how one can deal with difficulties one will face in the future, how to cope with emotions and decide ethically challenging questions, and how to prevent suicide. Senior doctors also sought his advice on the impending crisis resulting from the imbalance in numbers of the elderly retired over the young working population in society. In his replies, the Dalai Lama spoke about the importance of love and affection; warm-heartedness; inner strength; secular ethics; and reason, wisdom, commonsense and nobility of motivation. The day before, the Dalai Lama had addressed an audience of 1,800 people in Sapporo city of Hokkaido Island on the topic of universal responsibility. He was invited there by the Sapporo branch of Junior Chamber International, a non-profit international non-governmental organization of young people between 18 and 40 years old. The NGO has members in about 80 countries. Its aim is to encourage young people to become responsible citizens participating in social and economic development, while fostering international co-operation, good-will and understanding.